The Polk MagniFi Mini Home Theater Sound Bar System, with Dolby Digital 5.1 enjoy theatre sound as the ultra-compact size fits within small spaces but delivers big audio that’s enough to fill the room. Adjust the vocal clarity and volume control with dialogue for that clear voice. By streaming wirelessly, you can get your favourite music directly through your smartphone or tablet by either using Google Cast or Bluetooth. 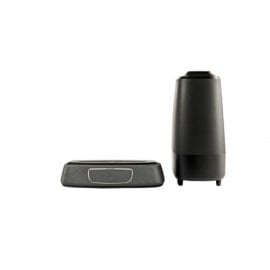 The MagniFi Mini brings big sounds to big rooms with the home theatre experience you can expect the sound bar to bring forth immersive sounds with its compact design. It is compatible with TVs and easy to set up the following features of Polk Voice Adjust and the surround sound technologies. With the wireless subwoofer for the bass, you can stream and feel your music through. With 5.1 Dolby Digital decoding, the surround sound technology can bring a sound bar and wireless subwoofer to create room-filling experiences. The Polk can work with various devices ranging from TV, Cable Box and Satellite thanks to its universal compatibility, there is no need for a second remote. Setup in minutes, with the included HDMI and optical cables, which allow you to plug directly into the sound bar, turn it on and you’re ready to go. Match your soundbar with the EQ settings, optimize to fit what you are listening to and make sure that you get the clearest of dialogue and surround sound for a home cinema experience. Setup your soundbar to match with the time of day, with the night mode setup, you can lower any bass and voice adjust to make sure that you have clear dialogue without affecting your settings for normal streaming or watching.